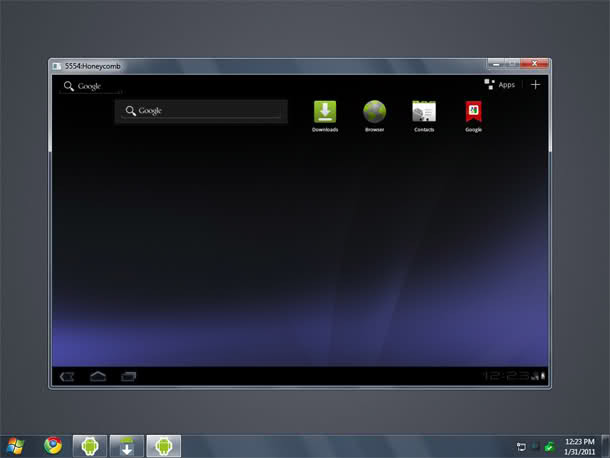 Google has released Android 4 ICS, Android 3.0 Honeycomb and 2.3 Gingerbread SDK to developers but you can use it to test drive and explore the new features of Android. It's a fully functional Adnroid OS on your PC, so you can install thousand of free Android games and apps in your virtual Android device. If you have a multi-touch touch device connected to your PC then make it full screen and use it as an Android tablet. Download Android SDK (installer_r10-windows.exe) and run it. Select Virtual devices from left pane and create a new Android Virtual Device (AVD). Choose a Skin or enter any resolution. Now select your AVD and click the Start... button. Wait for a few seconds and you will see Android boot screen. Wait for the Android to boot and then explore your shiny new Android or install apps. Check the box labeled "Force https://... sources to be fetched using http://..."
Close and restart the SDK Setup. All it needs is just specific version of Android SDK. Learn a bit from HP this time Google. It's interesting that you can but then again why would you want to. Extremely true. Android emulators are horrible stuff! Can't you use it with Virtualbox or VMWare? There was an Andorid Live CD project but it's dead now. The Honeycomb is buggy. Use Gingerbread SDK with high resolution. I got loading preferences error on Android 3 SDK. Yes even i get "error Loading Preferences" then I get the Android boot screen and within a few seconds the window becomes unresponsive "Not Responding" and then i have to force close it. I keep getting force close before it shows the main screen, All I see is the battery at the top. Edited by Frylock86, 30 June 2011 - 02:31 AM.